DULUTH, Georgia — A white Presbyterian minister with a passion to mend societal divides says if racial healing is to happen in the Church, white Christians ought to pay attention to the seemingly small things, even phrases like "ethnic food." The theme of this years' Catalyst conference in Atlanta was "uncommon fellowship," with various labs and sessions centered on how the Church can build bridges to distressed communities. 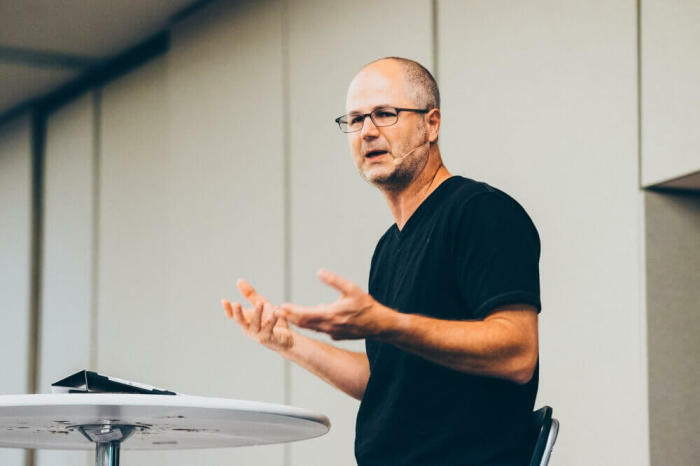 One such speaker and panelist at CatalystATL was Pastor Scott Sauls who leads Christ Presbyterian Church in Nashville, Tennessee. The Christian Post sat down with Sauls at the Infinite Energy Arena, where the conference took place, to further explore how the Body of Christ can be true catalysts for racial reconciliation. Given the public focus on race relations in an age where political tensions have notably increased, many Christian leaders are underscoring the importance of unity even as bitter divisions remain. In the town most famous for its Grand Old Opry and record producing, the Tennessee capital is a culture-making town, and with that comes considerable wealth and influence. But not everyone is benefiting. "Nashville in particular," Sauls told CP, "is a city that is quite divided." "There's one population of the city that is sort of on the rise, and has gotten national attention for that. But there are other communities that actually suffer, not just along side that ascendancy but in some ways because of it." Gentrification and the lack of outreach to minorities for lucrative contracts are but two examples of how this happens, he added. "This has become a matter for us [as a church], first and foremost, because this is a biblical justice issue," Sauls said. "Jesus is for all nations, He's for all people groups, He's for all socio-economic strata. He intends for His people to be one. And He intends for signs of His coming Kingdom to be developed through the Church now, sort of as a sign of what's to come." CP asked Sauls what he thinks are the most significant impediments to racial healing happening in the wider Church. According to Sauls there are two main barriers inhibiting genuine reconciliation. "One is economics, which tends to determine what neighborhood you live in. For instance, it is very difficult for an all black church to expect to reach Caucasians or Latinos if virtually every resident in a 5 mile radius is African-American. It's hard to expect that you're going to see a lot of diversity." "So geography, which is often driven by economics, is a huge factor not just in terms of proximity but then there's the matter of heart," he continued. And while every human is marred by sin, it is incumbent upon Christians in the majority culture, the pastor argues, to engage the conversations that might make them uncomfortable, even when buzzwords like "privilege" arise. "For instance, just phrases like 'ethnic food'" Sauls said. "There are assumptions that come along with that, that white is normal. Because when you think ethnic food, you think a person of color has prepared something from their culture, but the implicit bias behind that comment is that white is normal, everything else is ethnic. But in Jesus' day, white was 'other' ethnicity, he added, and it is the Middle East, not the American West, that is the center of the Christian story. For those who desire to see the Kingdom advance, developing a keen sense of what it means to walk in the shoes of minorities is essential. "And what that amounts to is, first and foremost, putting ourselves in situations where we are in the minority, and not just ethnic but generational, and put ourselves in situations where there aren't a whole lot of people like us," Sauls asserted. For more on Pastor Scott Sauls of Christ Presbyterian Church in Nashville, Tennessee, click here. To check out Sauls' book, Befriend: Create Belonging In an Age of Judgement, Isolation, and Fear and Jesus Outside the Lines, click here.